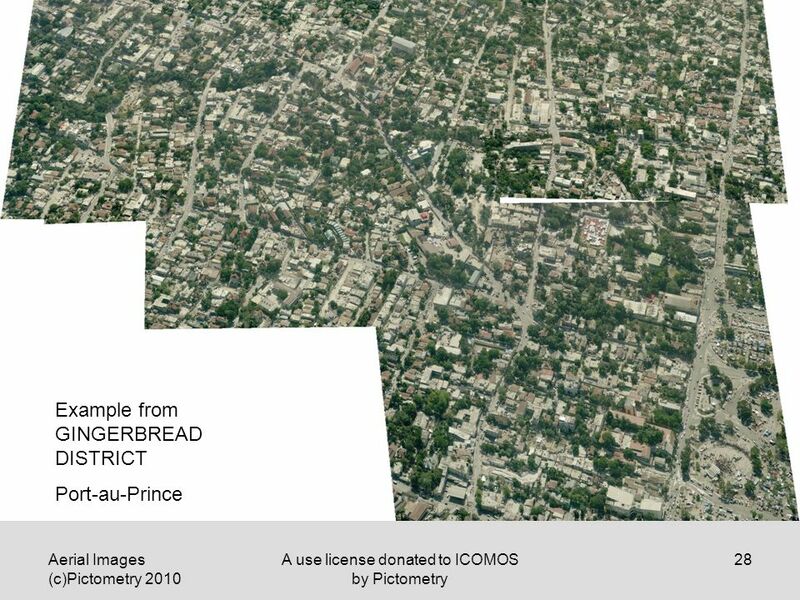 2 Aerial Images (c)Pictometry 2010 A use license donated to ICOMOS by Pictometry 2 The following slide show will demonstrate a way of utilizing the oblique-view aerial photographic survey of the Haiti damage district. 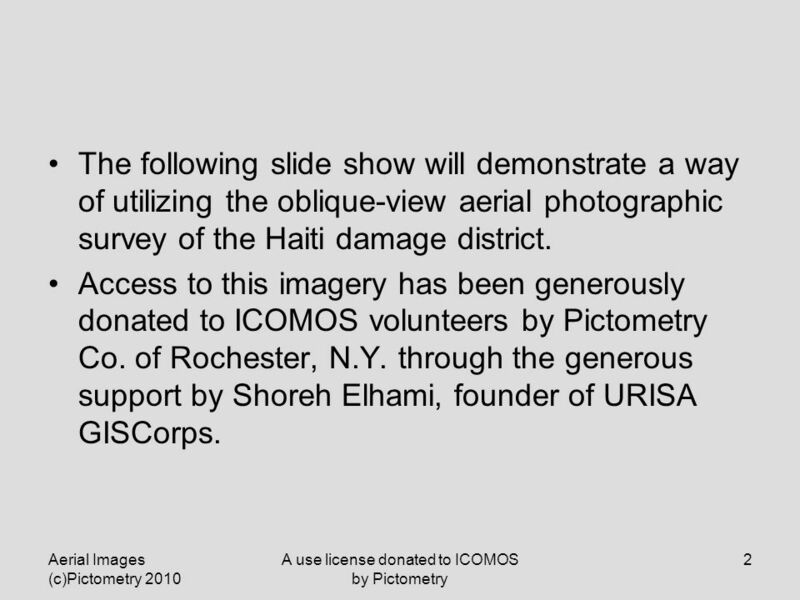 Access to this imagery has been generously donated to ICOMOS volunteers by Pictometry Co. of Rochester, N.Y. through the generous support by Shoreh Elhami, founder of URISA GISCorps. 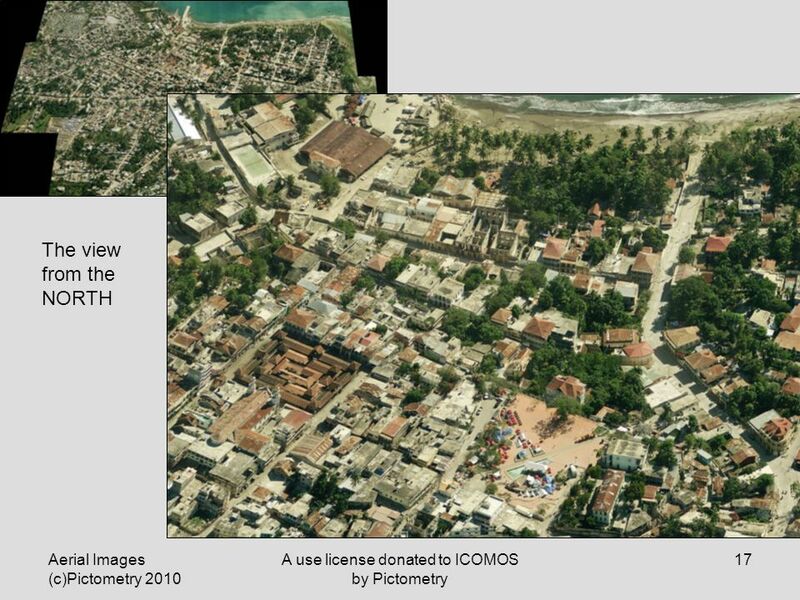 3 Aerial Images (c)Pictometry 2010 A use license donated to ICOMOS by Pictometry 3 IMPORTANT NOTE To avoid a jerky appearance to slide changes, I recommend that, before you begin, you go to SLIDE SHOW in the top menu bar and select SET UP SHOW, and then click to turn on “USE GRAPHICS ACCELERATION”. 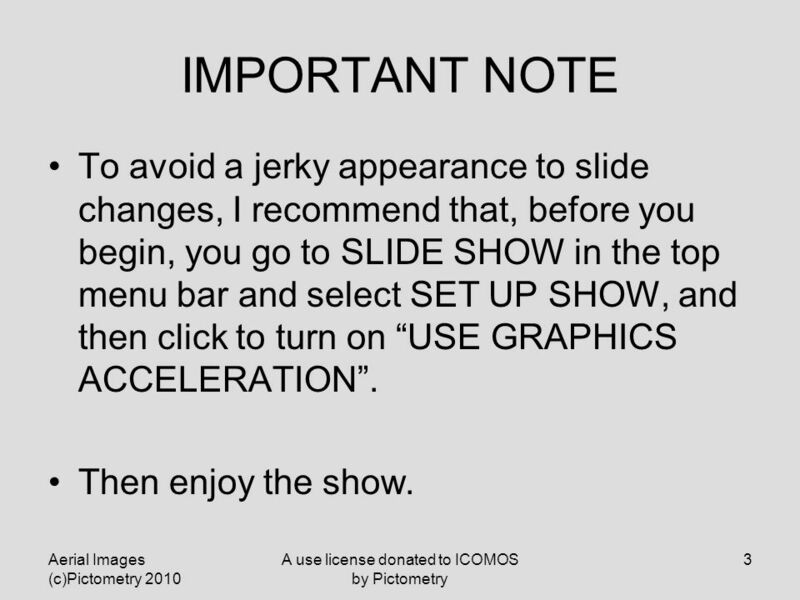 Then enjoy the show. 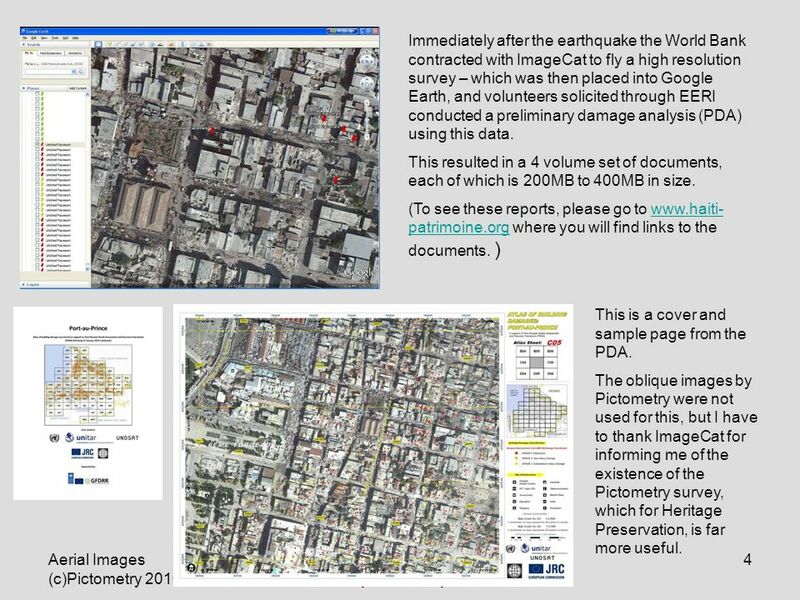 4 Aerial Images (c)Pictometry 2010 A use license donated to ICOMOS by Pictometry 4 Immediately after the earthquake the World Bank contracted with ImageCat to fly a high resolution survey – which was then placed into Google Earth, and volunteers solicited through EERI conducted a preliminary damage analysis (PDA) using this data. This resulted in a 4 volume set of documents, each of which is 200MB to 400MB in size. 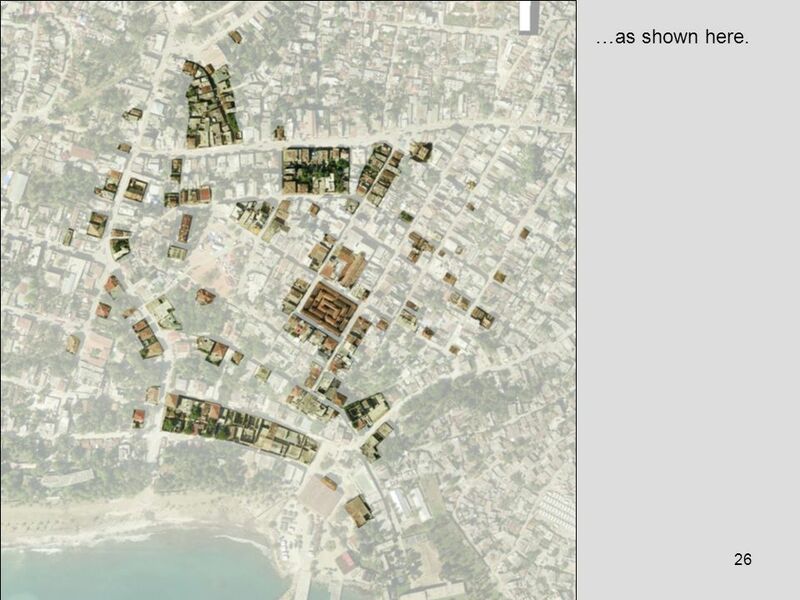 (To see these reports, please go to www.haiti- patrimoine.org where you will find links to the documents. 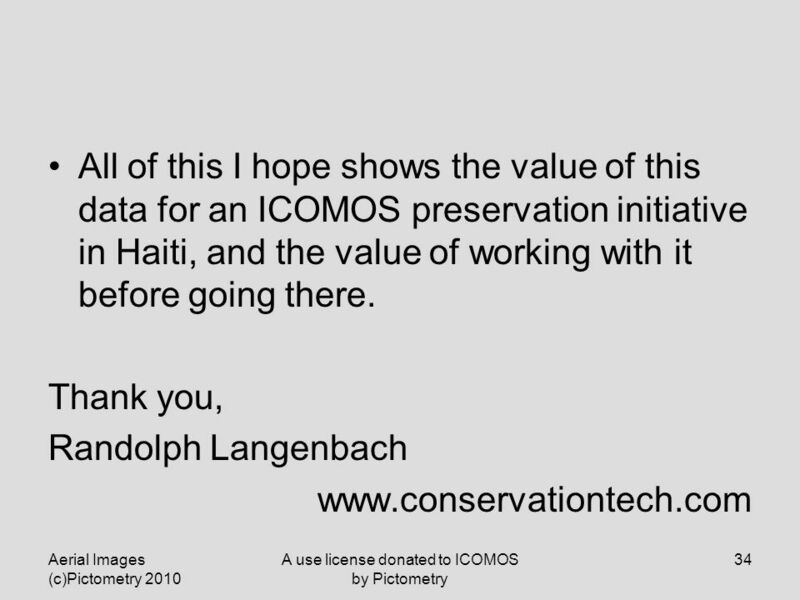 )www.haiti- patrimoine.org This is a cover and sample page from the PDA. 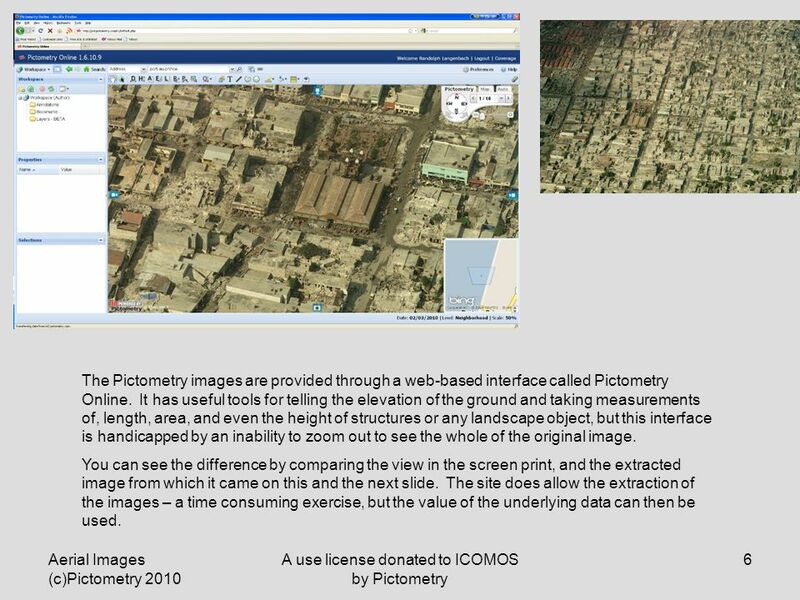 The oblique images by Pictometry were not used for this, but I have to thank ImageCat for informing me of the existence of the Pictometry survey, which for Heritage Preservation, is far more useful. 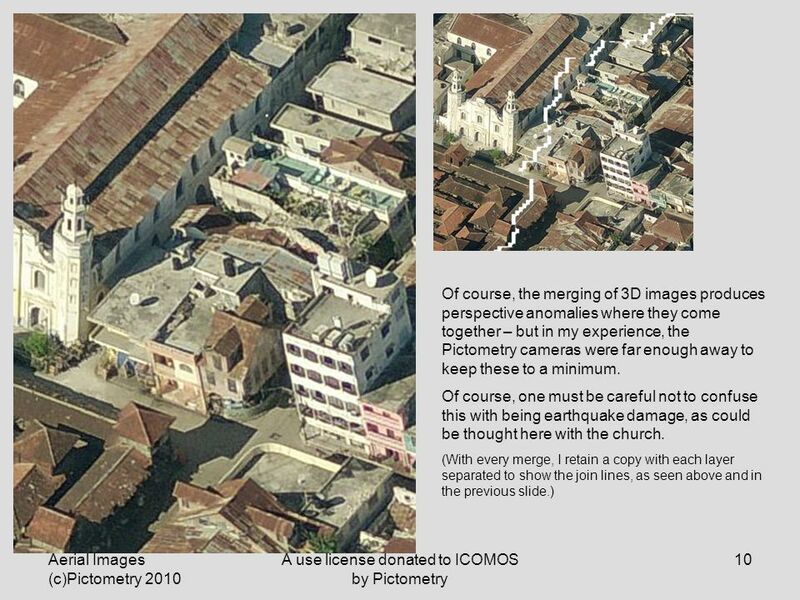 6 Aerial Images (c)Pictometry 2010 A use license donated to ICOMOS by Pictometry 6 The Pictometry images are provided through a web-based interface called Pictometry Online. 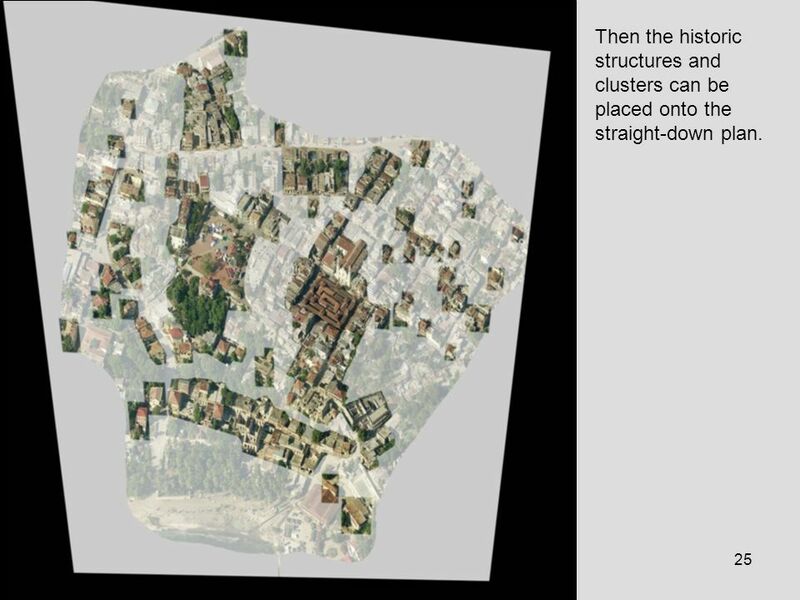 It has useful tools for telling the elevation of the ground and taking measurements of, length, area, and even the height of structures or any landscape object, but this interface is handicapped by an inability to zoom out to see the whole of the original image. You can see the difference by comparing the view in the screen print, and the extracted image from which it came on this and the next slide. The site does allow the extraction of the images – a time consuming exercise, but the value of the underlying data can then be used. 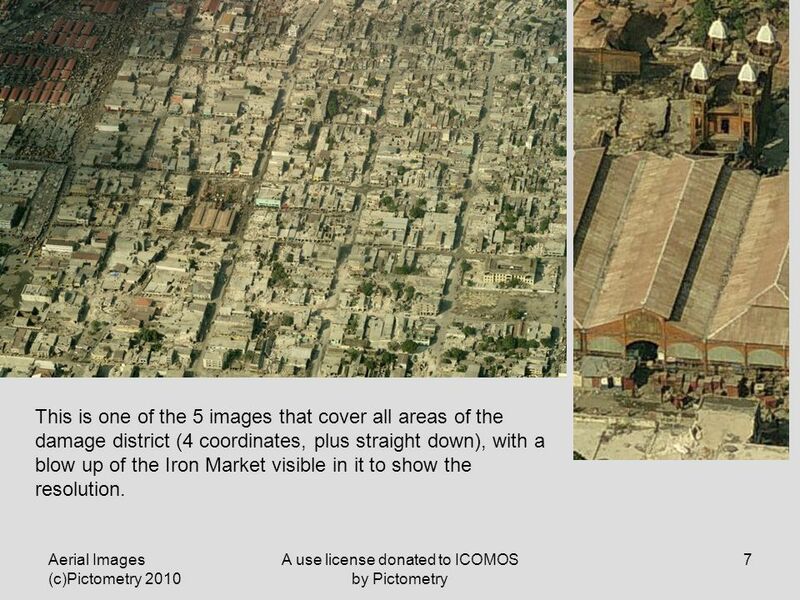 7 Aerial Images (c)Pictometry 2010 A use license donated to ICOMOS by Pictometry 7 This is one of the 5 images that cover all areas of the damage district (4 coordinates, plus straight down), with a blow up of the Iron Market visible in it to show the resolution. 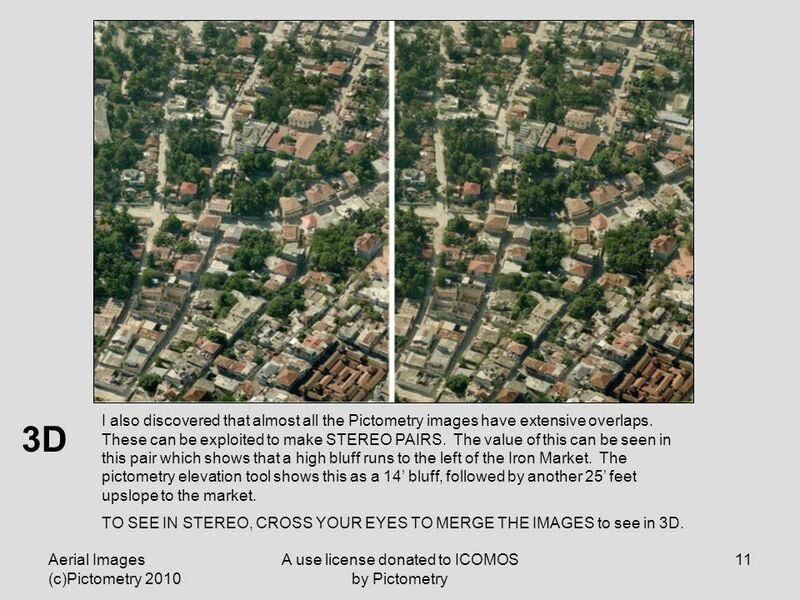 9 Aerial Images (c)Pictometry 2010 A use license donated to ICOMOS by Pictometry 9 This shows how Photoshop cut the individual images to form the merged mosaic. 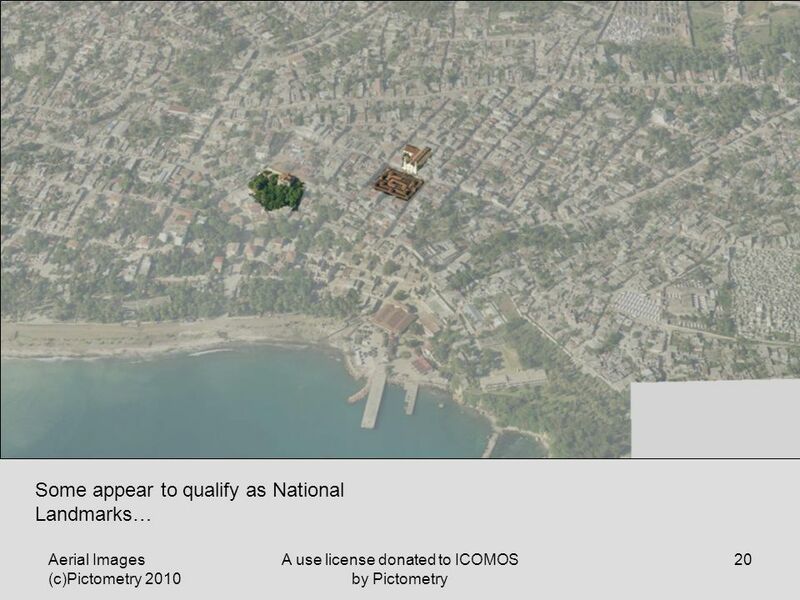 12 Aerial Images (c)Pictometry 2010 A use license donated to ICOMOS by Pictometry 12 The Jacmel Desktop Reconnaissance The following slides show how I undertook a survey of Jacmel utilizing this data. This is my first comprehensive effort of this kind working with such data, but even with figuring out how to do it, it took only 8 to 10 hours. 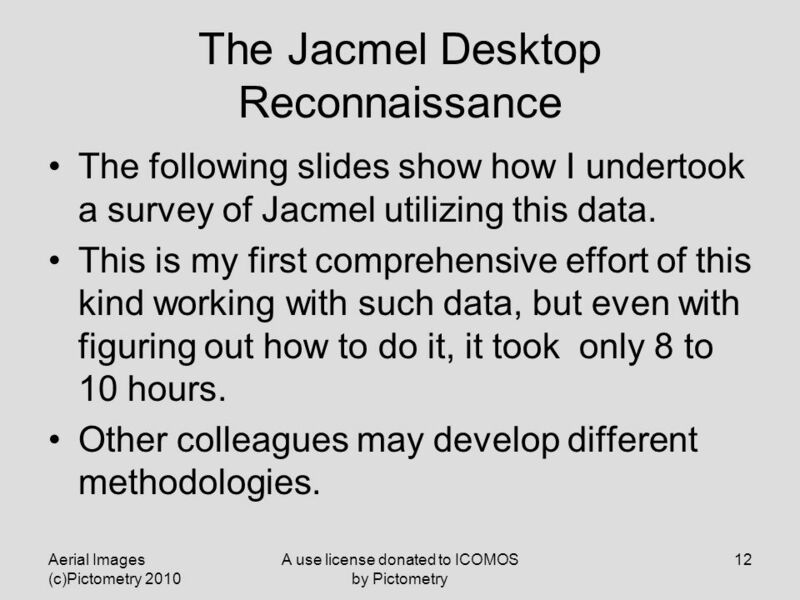 Other colleagues may develop different methodologies. 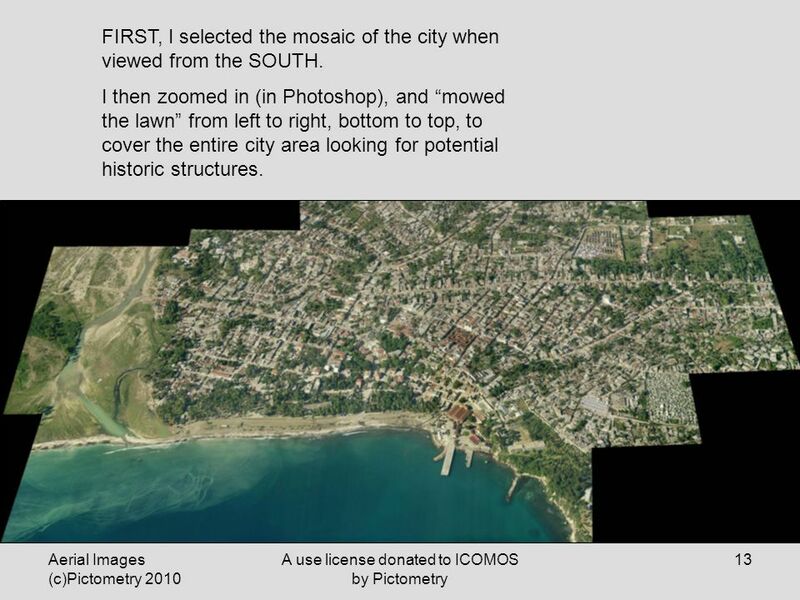 13 Aerial Images (c)Pictometry 2010 A use license donated to ICOMOS by Pictometry 13 FIRST, I selected the mosaic of the city when viewed from the SOUTH. 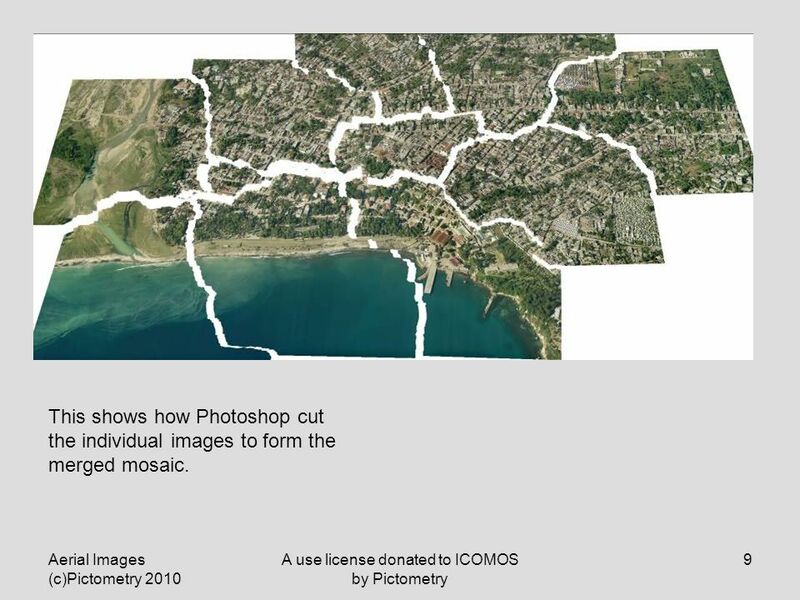 I then zoomed in (in Photoshop), and “mowed the lawn” from left to right, bottom to top, to cover the entire city area looking for potential historic structures. 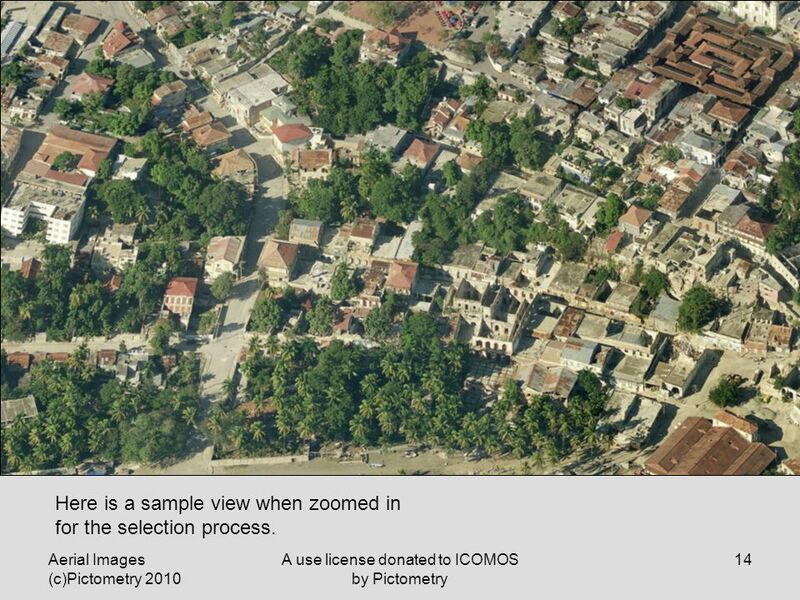 14 Aerial Images (c)Pictometry 2010 A use license donated to ICOMOS by Pictometry 14 Here is a sample view when zoomed in for the selection process. 18 Aerial Images (c)Pictometry 2010 A use license donated to ICOMOS by Pictometry 18 ….and this view is from the WEST. 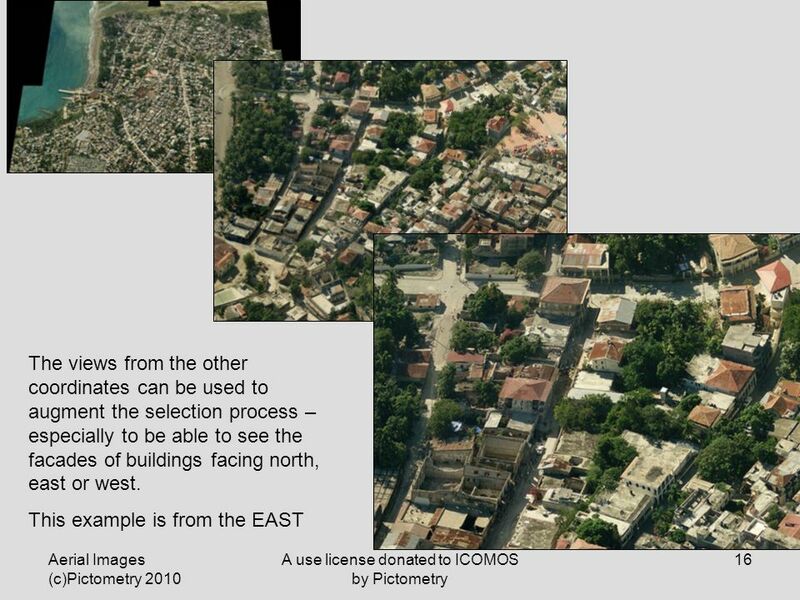 19 Aerial Images (c)Pictometry 2010 A use license donated to ICOMOS by Pictometry 19 The next step is then to identify the buildings, which I did using the Photoshop extract tool to create a new layer for each building and then grouped the layers. 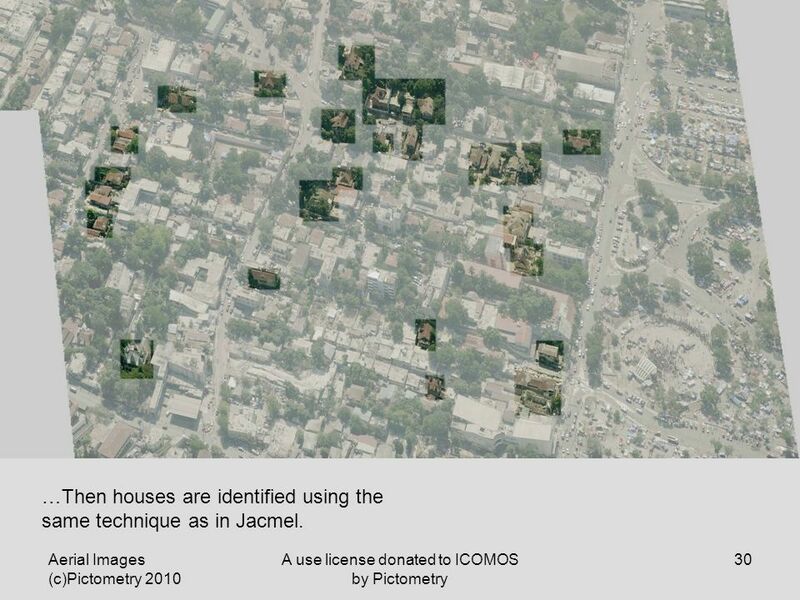 21 Aerial Images (c)Pictometry 2010 A use license donated to ICOMOS by Pictometry 21 Others are houses and commercial buildings potentially of significance. 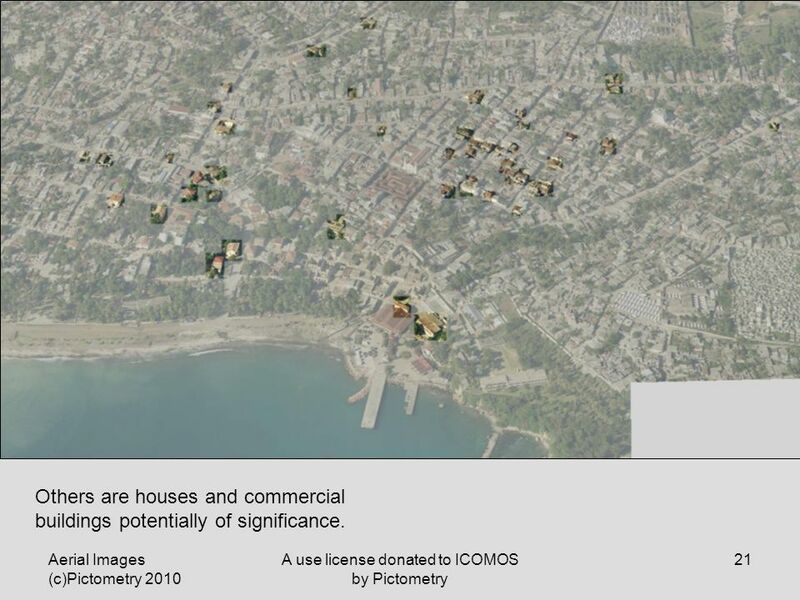 24 Aerial Images (c)Pictometry 2010 A use license donated to ICOMOS by Pictometry 24 A potential heritage district can then be shown with mapping accuracy. 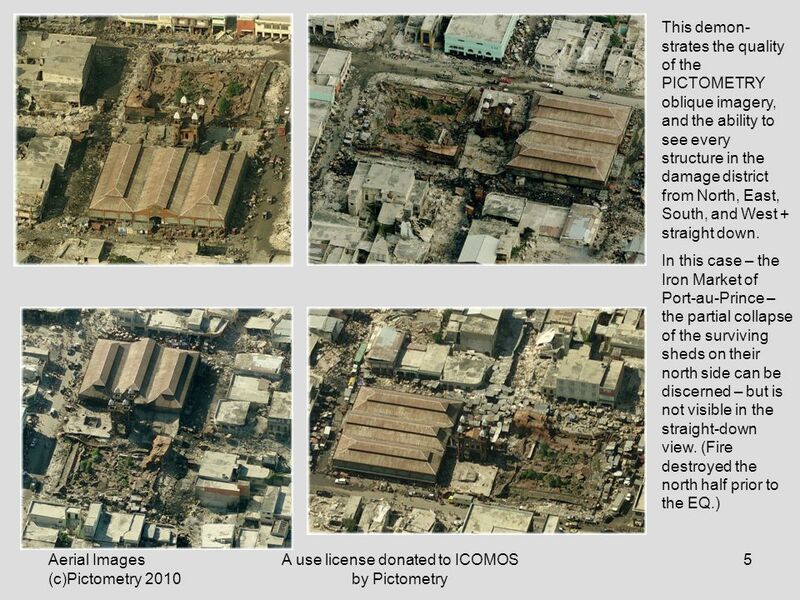 25 Aerial Images (c)Pictometry 2010 A use license donated to ICOMOS by Pictometry 25 Then the historic structures and clusters can be placed onto the straight-down plan. 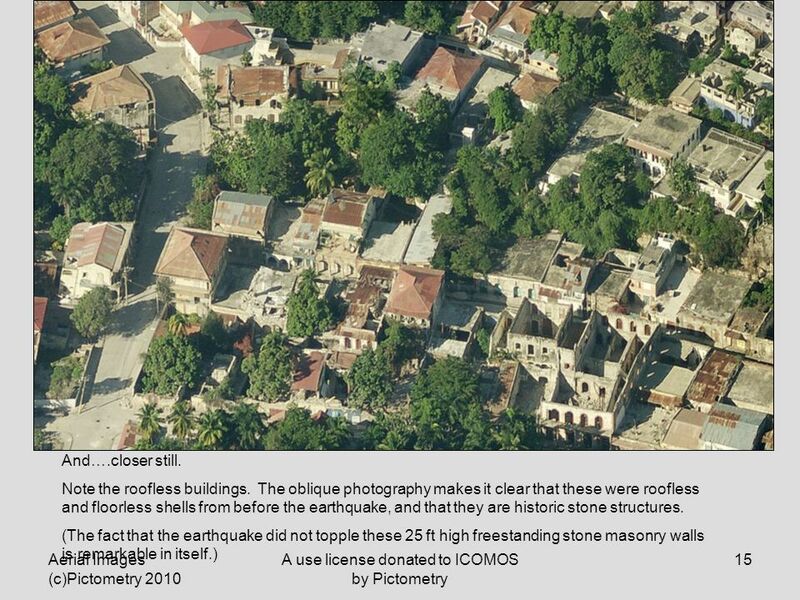 26 Aerial Images (c)Pictometry 2010 A use license donated to ICOMOS by Pictometry 26 …as shown here. 27 Aerial Images (c)Pictometry 2010 A use license donated to ICOMOS by Pictometry 27 As a tool for reconnaissance, this can be used throughout the city. 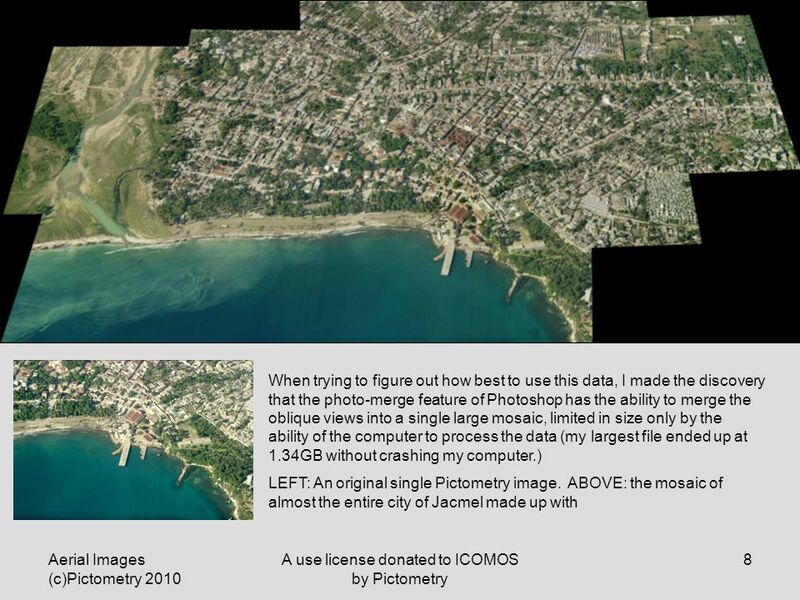 Pictometry covered all of Port-au-Prince, Carrefour, Leogane, and Jacmel. 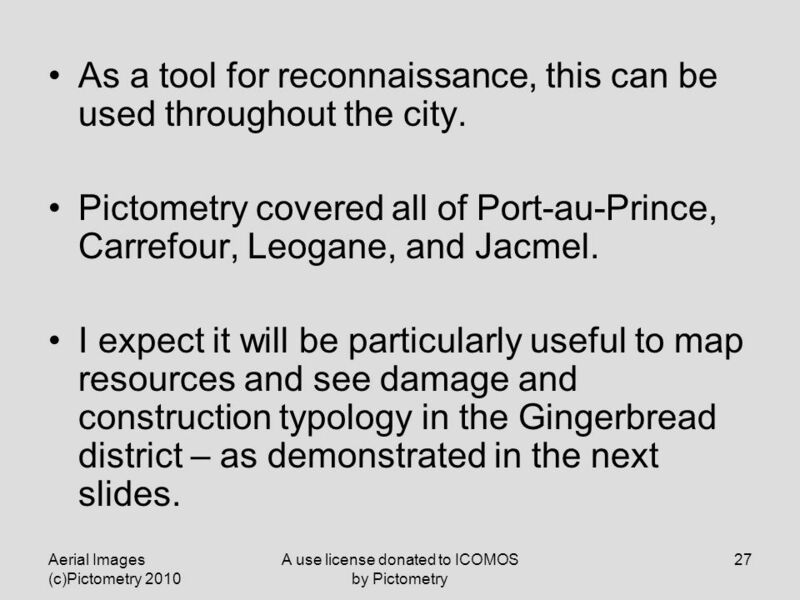 I expect it will be particularly useful to map resources and see damage and construction typology in the Gingerbread district – as demonstrated in the next slides. 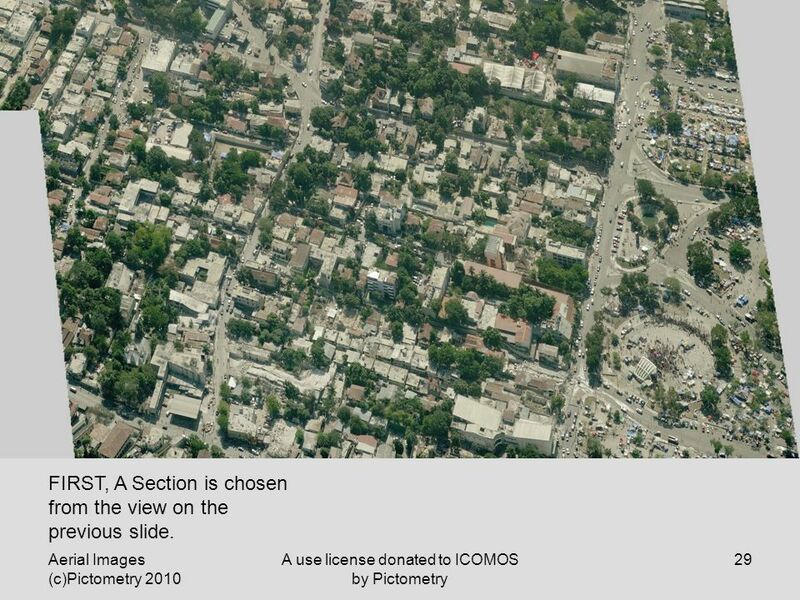 29 Aerial Images (c)Pictometry 2010 A use license donated to ICOMOS by Pictometry 29 FIRST, A Section is chosen from the view on the previous slide. 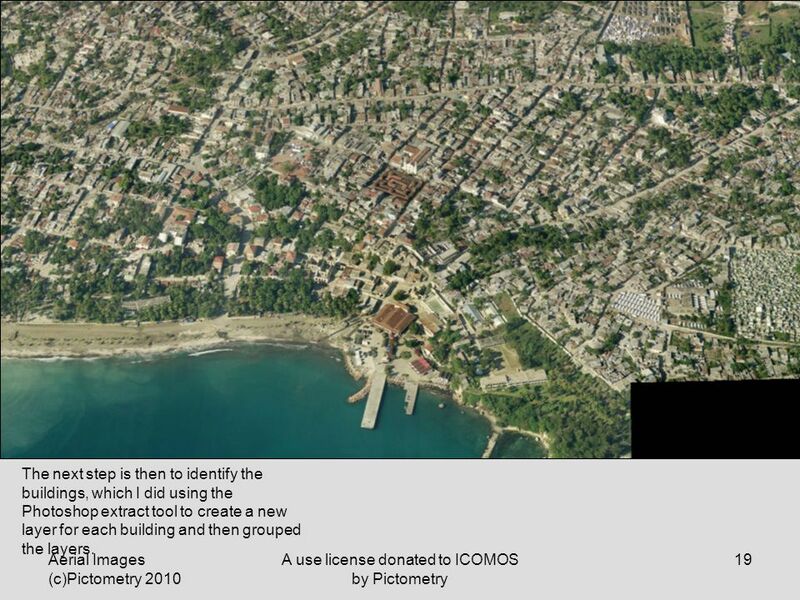 30 Aerial Images (c)Pictometry 2010 A use license donated to ICOMOS by Pictometry 30 …Then houses are identified using the same technique as in Jacmel. 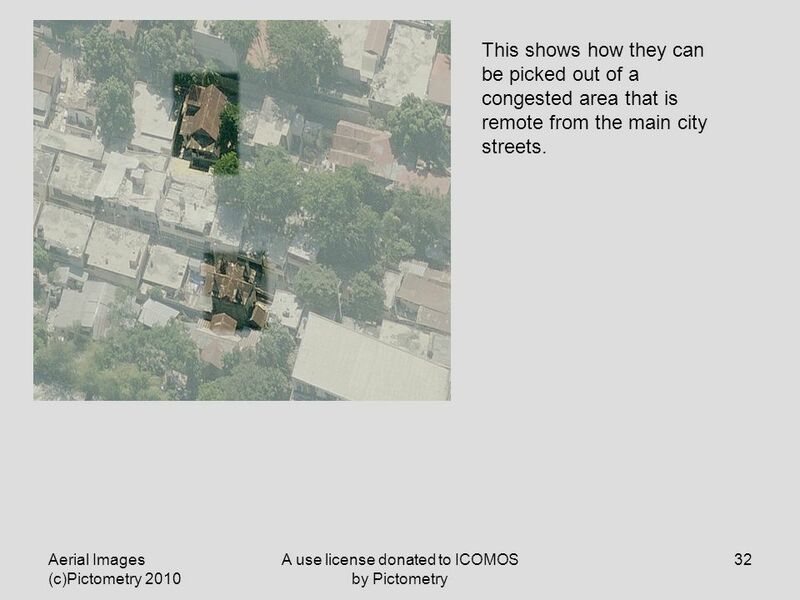 32 Aerial Images (c)Pictometry 2010 A use license donated to ICOMOS by Pictometry 32 This shows how they can be picked out of a congested area that is remote from the main city streets. 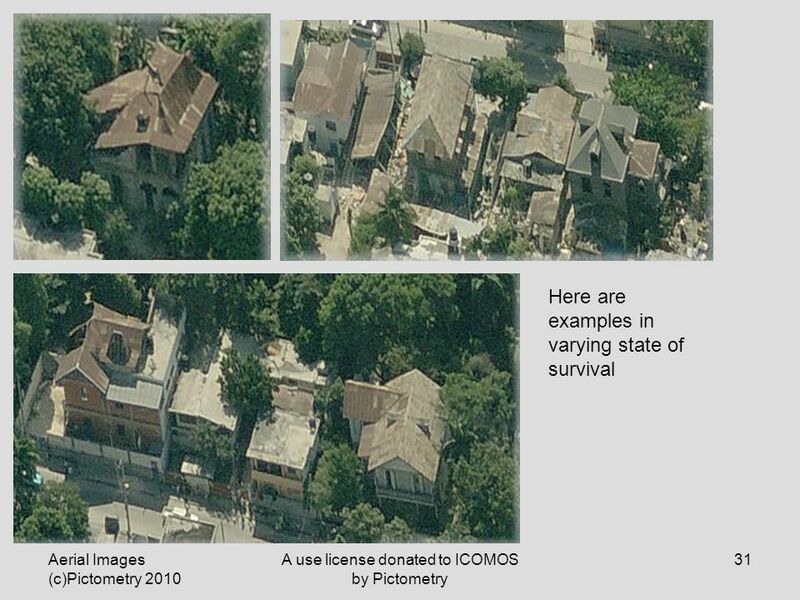 33 Aerial Images (c)Pictometry 2010 A use license donated to ICOMOS by Pictometry 33 Here are two examples of buildings that may have been gingerbread houses that are in ruinous condition. 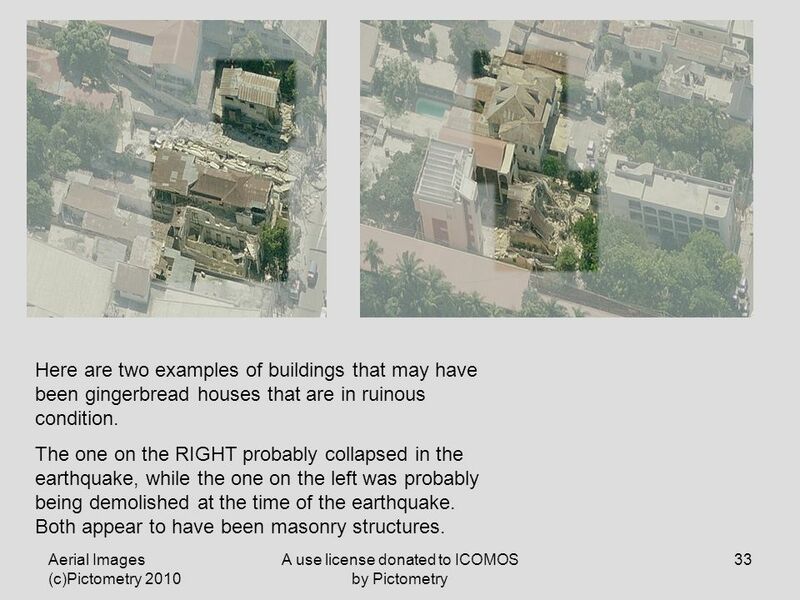 The one on the RIGHT probably collapsed in the earthquake, while the one on the left was probably being demolished at the time of the earthquake. Both appear to have been masonry structures. 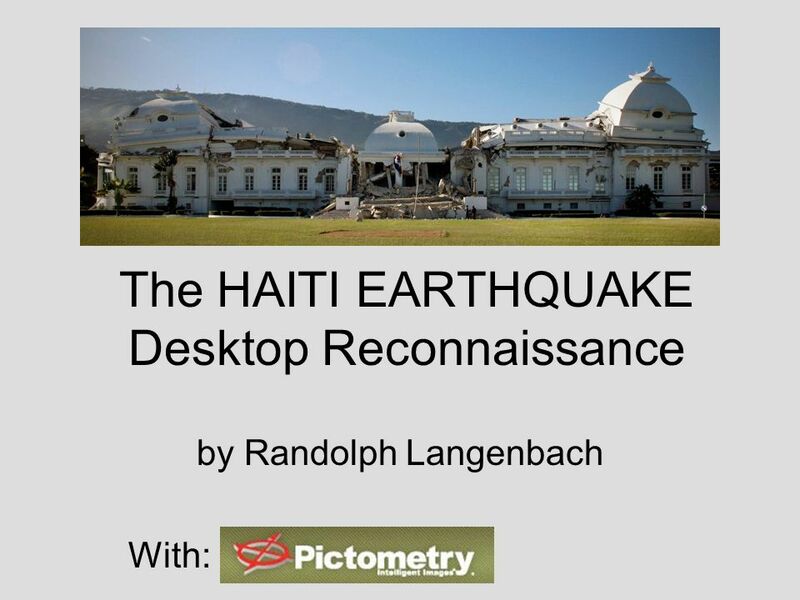 Download ppt "The HAITI EARTHQUAKE Desktop Reconnaissance by Randolph Langenbach With:"
How to utilize your iTunes for use with your SwiMP3 Please be aware that all the SwiMP3 line of players do not have licensing to any of the songs that. Polk County School Board Geographic Information Systems. 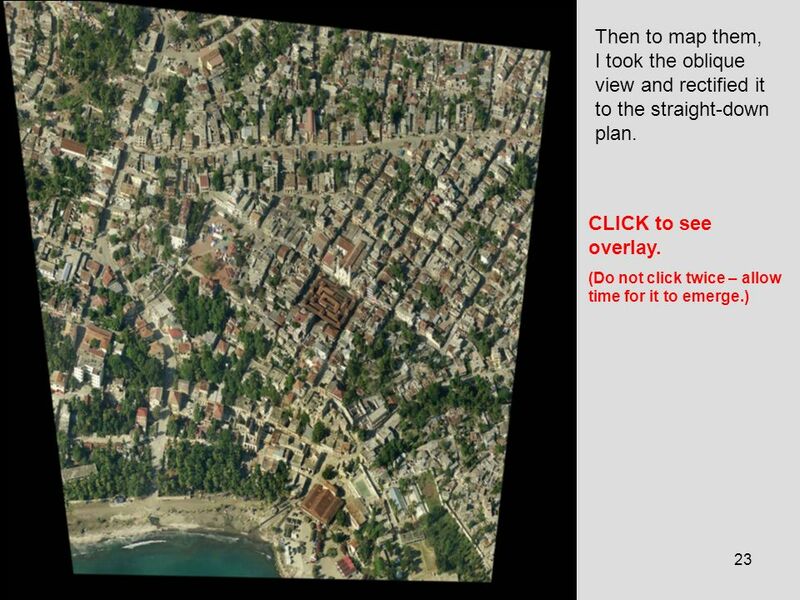 Google Earth/Sky in the Classroom. 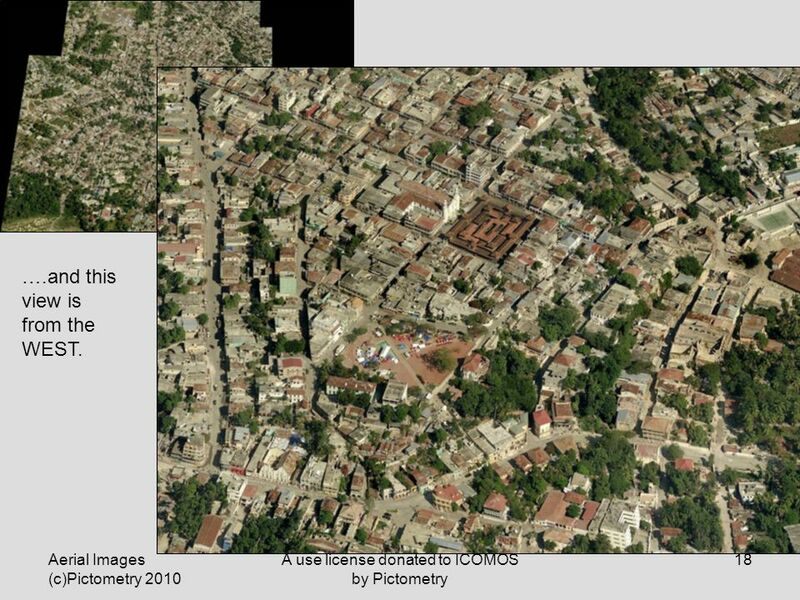 What is Google Earth/Sky? Google Earth is free program which allows users to: Explore geographic locations both on. Little Green Signs Just What the Heck Are These? Chapter 6 Photoshop and ImageReady: Part II The Web Warrior Guide to Web Design Technologies. Section 106 Clearance Application Missouri Local Programs How to Complete the Application for Section 106 Clearance. Where In The World? GPS Instruction For Teachers By: Krissy Vaux & Mark McBride Tri-Valley H.S. Downs, IL STARS April 8, 2005. Historic Digimap Historical maps and data from the Ordnance Survey maps from the 1840s to the 1990s. 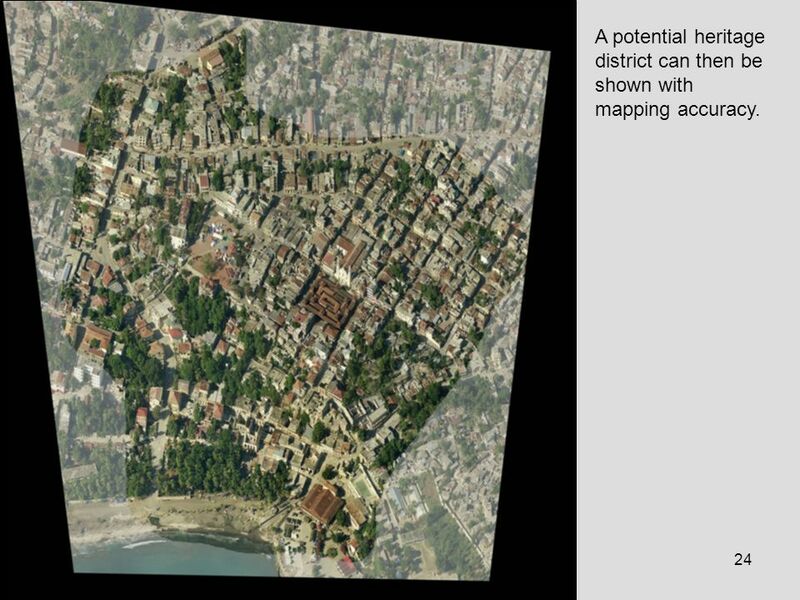 CS 128/ES Lecture 10a1 Raster Data Sources: Paper maps & Aerial photographs. Know your stuff and stay found. A common error that appears on the copier’s screen is seen here when a scan to Sharpdesk is not sent to the computer successfully. This guide intends to. Importing, Grouping, and Layers – Lesson 31 Importing, Grouping, and Layers Lesson 3. Blackboard student guidepage 1 of 21 Blackboard Basics – finding your way  this guide explains how to find your way around a Blackboard course.  click. Roundtrip Tickets Anywhere: Google Earth in Education Justin Karkow Discovery Education.